St. Patrick's Day is a favorite holiday of Porcelains and Peacocks and it is an excuse to look at the genius of Irish artist Harry Clarke (1889–1931). Born in Dublin on St. Patrick's Day he was a major contributor to the Irish Arts and Crafts Movement. 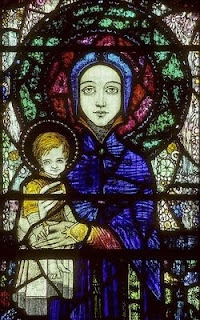 Clarke's work centered on stained glass and book illustration. An early visit to Chartres Cathedral inspired him to use brilliant jewel toned stain glass for both his religious and secular themed windows. Clarke was associated with the An Túr Gloine, Irish for “Tower of Glass”, a cooperative studio for stained glass artists that offered Irish architects and builders an alternative to the commercial stained glass imported from England and Germany. 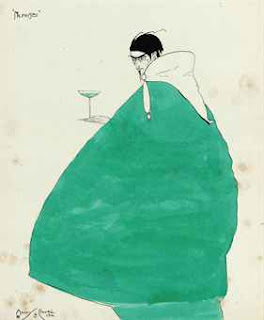 As a book illustrator he was a part of The Golden Age of Illustration. 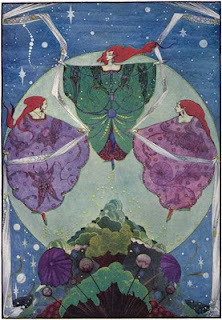 Clarke’s illustrations ranged from the beautifully grotesque Faust to the poetic "They danced with shawls that were woven of mist and moonshine" of the Fairy Tales by Hans Christian Andersen.